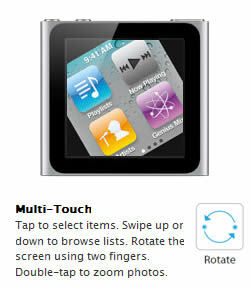 Apple has finally fit a multitouch interface into the 6th generation iPod Nano. In order to cram that into the diminutive form factor, users give up a few features such as video recording, playback, and the orientation sensor. Dropping the sensor seems logical now; the device is so small that orientation loses its meaning, and with a 1:1 aspect ratio there's no potential for a better fit for the on-screen content. I love the new approach of actually rotating the screen with your fingers, in the event you actually need to (assuming that would be due to the way it's clipped to you). There's a great demo of multitouch on the Nano at Apple's website using the latest and greatest techniques in CSS animation (sorry, Chrome or Safari only). This update got me thinking about the lost orientation sensor, and when it can frustrate more than delight. I purchased the last generation iPod Nano for my girlfriend. What I got back was an ethnographic study. Although she loved the build quality of the device and the fact it held all her music, it turned out to be less than ideal for her most common use — at the gym. The device was so slim it tended to slip out of her hand when running, but her single biggest issue was the intrusive orientation sensor. Even though the screen was a scant 2 inches, if you tilted it, the iPod entered CoverFlow. This is a fun shortcut, and I'm sure Apple wanted to tout its inclusion, but it's not very useful when you're in a pre-made playlist and just want to skip a song you don't like or adjust volume. In other words, when interacting with the device becomes secondary to what you're doing. In searching for a fix, I found others with the same simple request, "Why isn't this configurable?" Ideally this is something you can address in a software update. My girlfriend's solution to the problem was to lock the iPod. This gets the job done, but it's obviously not optimal, since this doesn't allow her to do the few actions she did want to do without first unlocking it. I wonder how other mobile users feel about orientation sensing and device/screen size. Was the older nano already small enough to omit this feature? Or maybe the larger issue was simply what the switch triggered — opening CoverFlow seems great for demonstration, but at least in my experience it was counterproductive in daily use.